For the first time ever, scientists have used Crispr technology to gene-edit a reptile. A new study recounts how a team successfully tweaked the genes of 146 brown anole lizard embryos. First reported by Science magazine, the scientists created four albino lizards — each no bigger than a finger when they hatched. The lack of pigmentation was a sure sign that their gene-editing trial had worked. Researchers have used Crispr to alter chicken, pig, cow, and even fish genes. But this is the first time the technology has been brought to bear on reptiles. Gene-edited reptiles could be used to help test therapeutic drugs or control invasive species in the Everglades. Over the past several years, researchers have successfully modified chicken, pig, cow, mouse, and even fish genes using Crispr technology, a tool first patented in 2012 that allows scientists to tweak individual genes and change DNA sequences inside cells. Crispr can be used to create pest-resistant genetically-modified crops, correct genetic defects like blindness, treat cancer, and breed malaria-free mosquitoes. But reptiles like snakes, lizards, and crocodiles were considered off the gene-editing table because of the creatures’ unusual reproductive systems. A group of scientists at the University of Georgia have successfully altered the genes of four brown anole lizards, which were eventually born lacking the typical brown pigment from which the species derives its name. The team first reported their results online March 31, 2019 in a bioRXiv paper that hasn’t yet been reviewed by other scientists. "The whole field of developmental genetics has left reptiles in the dust," Douglas Menke, study co-author and associate professor of genetics at the University of Georgia, told Science magazine, the first publication to report on the team’s successful gene-editing work. These genetically modified lizards, however, are changing that reality. "Needless to say we were both jazzed about the addition to the lab," Ashley Rasys, a graduate student in the University of Georgia’s cellular biology department and lead author of the study, told Business Insider. 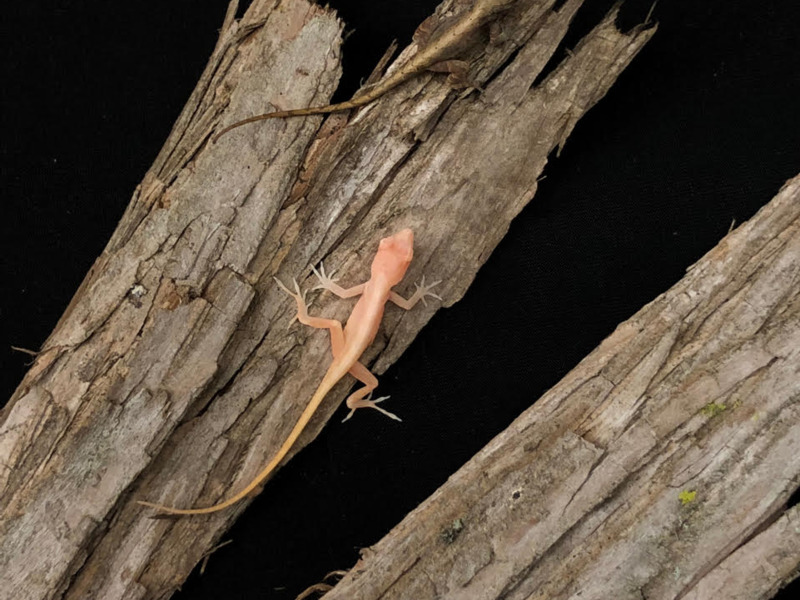 Rasys and Menke chose to attempt gene-edits on the brown anole lizard, or Anolis sagrei, because of its small size, long breeding season, and how frequently females lay eggs. The scientists injected the females’ unfertilized eggs with the Crispr tech while they were still in the ovaries, and then allowing mating and breeding to happen naturally. The team targeted a gene responsible for the enzyme tyrosinase, which affects the lizard’s color. If the gene is de-activated, the hatchlings should come out lacking pigment. 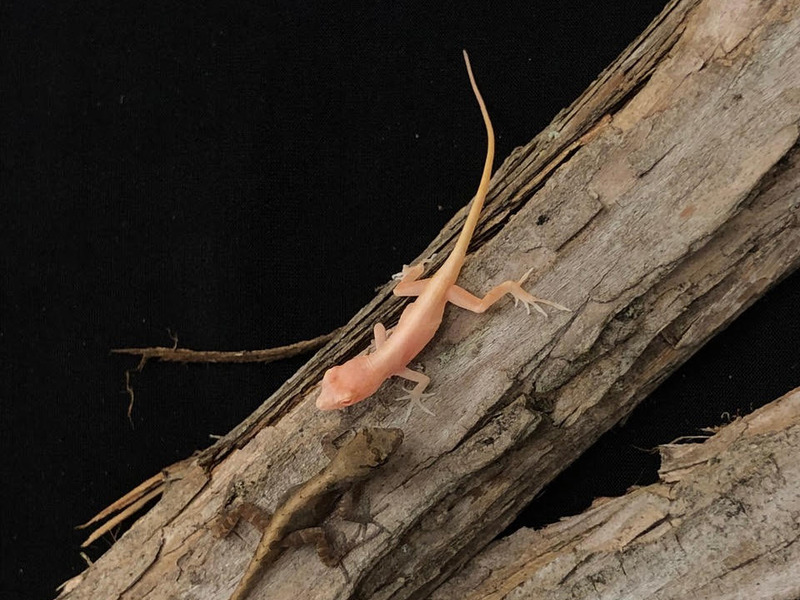 So an albino baby lizard was a sure sign that the scientists’ gene-tweak had worked. They edited 146 eggs from 21 different lizards, and four of the hatchlings them emerged as albinos. Unfortunately Rasys and Menke were in a meeting during the historic hatching. "Another member of our research group witnessed the hatchling emerge from its egg," Menke told Business Insider. "I received a text message with a photo of our first albino lizard while I was in a meeting. Needless to say, I excused myself from the meeting as soon as I could." Rasys, too, said she witnessed her first glance of the team’s "new arrival" through that same text. Menke said the gene-editing produced both male and female lizards, some two inches in length (though more than half of that length comes from the creatures’ long, skinny tails). While the lizards don’t have names, each lizard receives a unique ID to help the scientists track individual animals. For Menke and Rasys, this achievement represents more than just bucking one of Crispr’s longstanding limitations. "There is a whole universe of unstudied biology in these animals," Menke said. "Gene editing is the most direct way to explore gene function in these species." There are over 10,000 described species of reptile, and the genome of each species contains around 25,000 genes, he added. Studying reptile genes can improve scientists’ understanding of human biology, too. For example, people who are born without pigment, much like these anole lizards, also tend to have poor eyesight due to defects in their eyes. The major cause of these vision problems is that the fovea (a pit-like depression in the human eye which enables sharp, clear eyesight) is absent or under-developed, Menke said. Most animals used for genetic studies like mice lack a fovea, and therefore can’t be used to understand foveal defects. But the lizards Menke and Rasys’ team are working with hunt insects and need high acuity vision; their eyes have fovea. "Finally we have an animal that we can use to understand human foveal defects," Menke said. 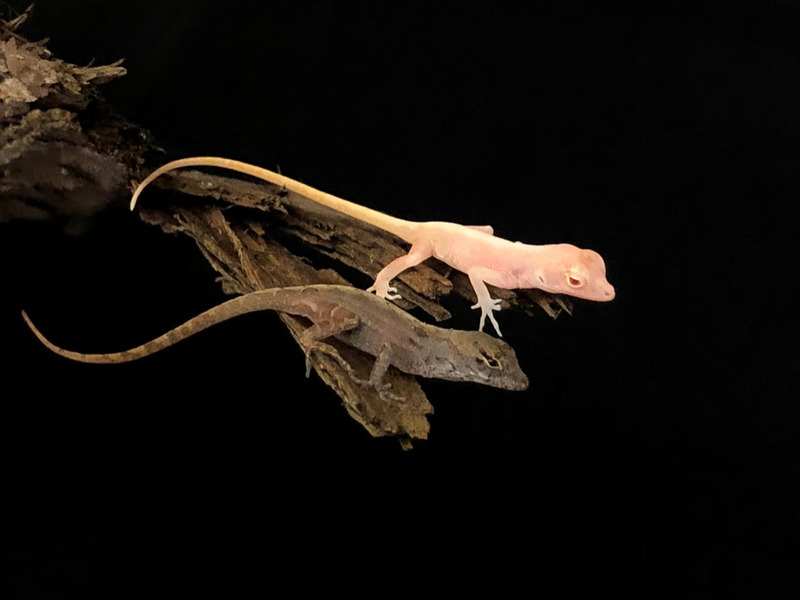 Having the ability to tweak lizard genes opens the door to identifying therapeutic targets and testing drugs in developing lizards, Rasys said. Menke also added that gene editing could be used in animal conservation efforts. Invasive reptiles — particularly those in Florida, like the Burmese pythons in the Everglades — can harm native wildlife. "There are certain gene editing approaches that might be used to help control some of these invasive species of reptile," Menke said. SEE ALSO: A Chinese scientist claims to have genetically engineered babies. Here’s what editing DNA means.